Let me know if it doesn’t match up with your exp. Screenshots would be appreciated. In before "YOU’LL GET HACKED!" It’s an HTML page, you can simply view the source to confirm what it does. Wealthy gives 20% premium bonus exp. Healing only increases 50% exp, not 150%. Bless of Light (Greater) gives 40% premium bonus exp. Pet + Ring set should give 65% bonus exp for brown and pink panda ring. One point that Ive never noticed til now is that for each increase of 50% exp, premium bonus exp increases 10% (0.1). Do you have screenshot of exp screen for these items by any chance? I got the healing 150% for ML from the xshop description, will need testing. I’ll fix the premiums after work. There was a guy who took incremental screenshots of all the exp items being applied, but I cannot find them. Updated. Can you verify that pink panda ring actually gives an additional 65% and doesn’t just display 65%? Would be nice to know the exp given by monster level and your level. I know each character level decreases exp, but I’m not sure base exp is based on mob level. I have a feeling it is set per mob. Be a lot of work to figure that out. Easy to just attack a mob get base exp, run through calc and find out how much more in gold or with seals. k2notwork? ^^ Plese update that. Yeah, but there isn’t any funny puns on webzen. 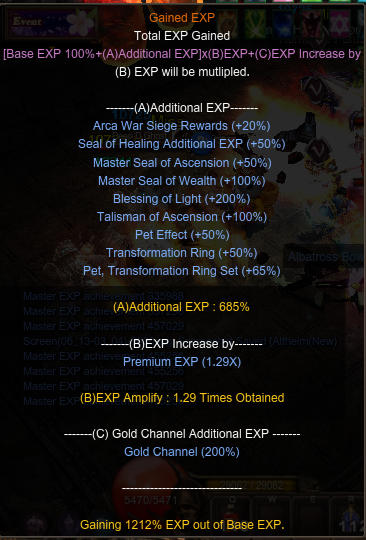 Updated, fixed panda ring bonuses, fixed firefox’s rounding error, added ToA II and III. Added Level cal to it. Change Skel ring pet bonus. Still didn’t figure out exp when server exp bonus. Added new exp for lvl 800 ~ 920. Not sure if bonuses stack the same way or if they changed it. 2) This means that the difference between F2P and P2P is narrowed, back then with this set up, I would have over 3.5k % XP, while now I "only" get 12 times what a f2p player would. Last edited by (VM)Javiercar; 13-06-18, 01:20 AM. This calculator still working in actuall season? No, it isn't, check my post avobe.